After a few so-so artbooks (Inside Out, Good Dinosaur and Cars 3), it’s great to see another Pixar artbook that’s actually worth getting for the art. This latest 160-page hardcover artbook is still published by Chronicle Books. If you have not watched the movie, note that there are going to be spoilers in the form of images in this artbook. You probably want to know as little as possible about the story before you watch the film for your full enjoyment. 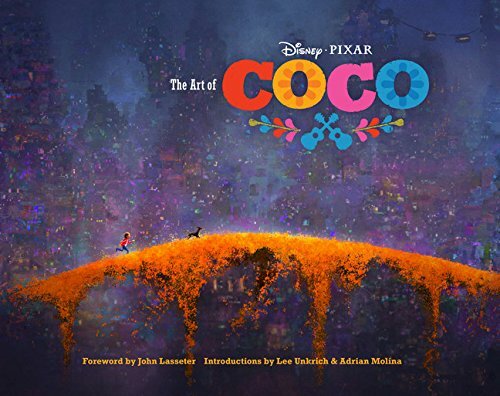 My first impression after I flipped through the first few pages was, “Wait a minute, didn’t another animation studio already use this theme?” The premise of the Coco’s story is having the main character, Miguel, cross over to the Land of the Dead on the night of Dia de los Muertos, which is also called the Day of the Dead, a Mexican holiday. In 2014, the animated film Book of Life also used the Day of the Dead as the main premise. It’s not really a big deal. There’s just minor deja vu feeling. The main thing is, the art in this book is good. This artbook is filled with plenty of wonderful concept artworks. There are sketches, storyboards, colour scripts, sculptures, coloured illustrations for character designs and environments. The character designs are lovely. They definitely look and feel different compared to the style from Book of Life. Characters here still look Pixar-ish, if you know what I mean. The environment artworks are really beautiful. I like to see how the world of the dead is interpreted by the artists. And you can also see where the artists get their inspiration from because photos from the team’s travel research trips are included. The brief amount of text included are quotes from the staff talking about the characters and designs. Overall, it’s a delightful artbook. It’s worth the money. And it’s great that this time it appears that effort has been made to curate and layout the artworks properly.